The text is the Prodigal Son, so you already know it. It is the gospel. Nothing can separate us from the Love of the Father. But this sermon wants to meditate on the text in a little different way. How, if we haven’t been conditioned to hear it as we have been, would we hear it? What did the original hearers think? (I think they would have jumped at the two brothers theme. Jesus doesn’t go where an OT raised person would expect. More in the sermon.) What would someone in our West hearing this for the first time think? (I think this might be more common that we know. And I think it would be the absolute Sovereignty of the Father in the story. And the prideful natures of the sons. Again, more in the sermon.) Hearing it new today, yes, it is a parable about love and grace, but it is also a parable about pride. The only thing that separates us from the Love of the Father is our pride. But He is sovereign. And how he has done things, was necessary. And he doesn’t consult us. Do we humble ourselves, or would we rather be outside the party and the love? Blessed are the Lottery Winners? In some ways it is a harmless diversion. But there are other ways that the lottery, especially when it is so big and has persisted at this level, can be straight from the devil. 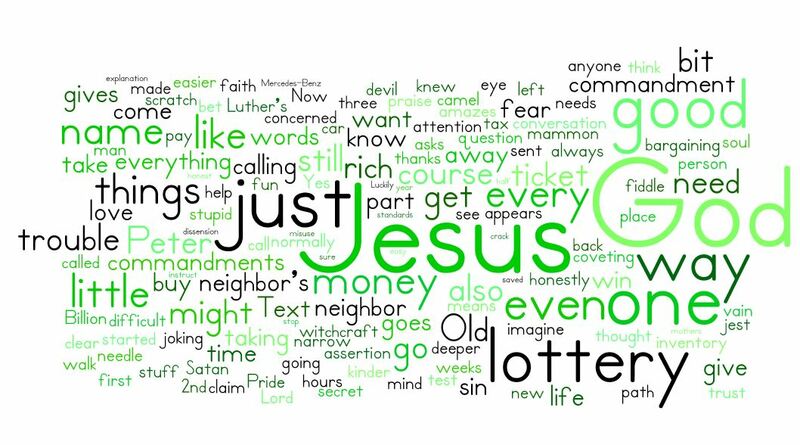 The first part of this sermon is a old fashioned moral inventory – a preparation for confession – based on the fact of the lottery’s effect on this soul. It seemed appropriate given the text based in camels threading they way through needle’s eyes. Since it is not our typical failing it gets the shorter time, but there is the flip side of money troubles, pride in asceticism. Both of the ditches highlight how it is not possible with man. But all things are possible with God. This is Trinity Sunday on the Christian calendar. That means a couple of things. The first is that we typically roll out the long creed – the Athanasian Creed. We break it into two logical portions in the service and I’ve tried to capture that here. The second thing that Trinity Sunday invites is a more theological approach. What I mean by that is that the day concerns the nature of God which is something that we can never fully comprehend. If we could, they we aren’t pondering God. This sermon is an attempt to mark out some of the boundaries of pondering God. Not boundaries on God himself, but things that should bind us. 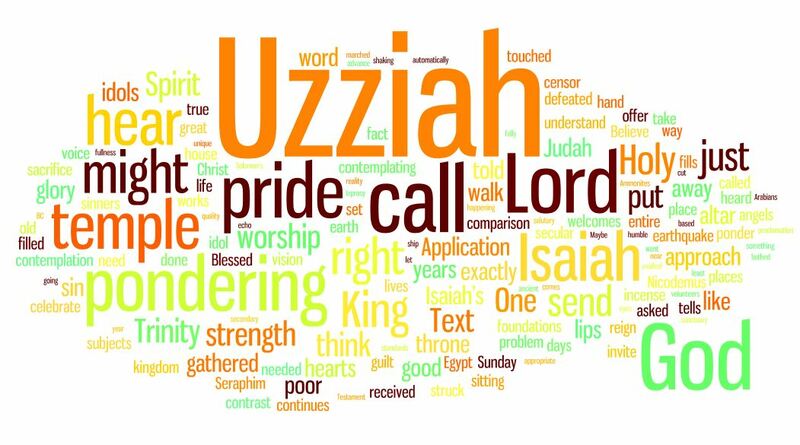 And it does this through a contrast between King Uzziah, whom the text starts off telling us died in the year of Isaiah vision, and Isaiah’s vision and call. The contrast I’d boil down to the path of pride and the path of promise. One is the path of life and the other of death. I hope you enjoy this. The parable and the life picture in the text may not on first glance appear to go together. What do the a compare and contrast of the Pharisee and the Tax Collector at prayer have to do with mothers bringing babies to Jesus? But the theme running through both is humility and spiritual pride. The kingdom belongs to the children, the tax collector went down justified, while the Pharisee exalted himself, and the disciples subtly sought to do the same. 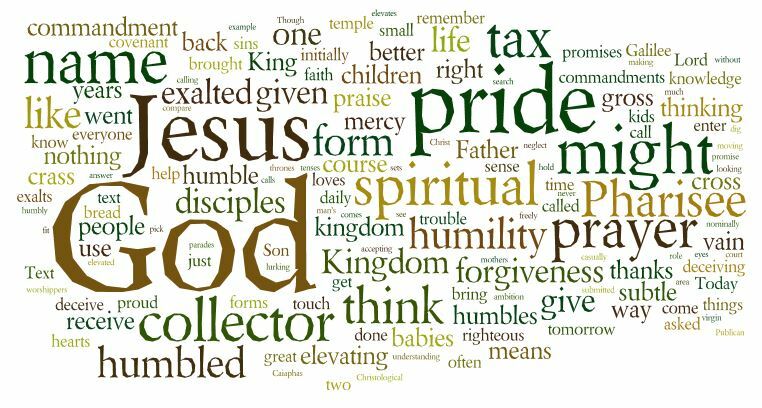 This sermon grounds humility/pride in the second commandment, how we use God’s name. It examines the coarse form of pride of the Pharisee, but also the subtle pride of the disciples, and how both of these play in our life. It presents Jesus as the one who humbled himself for us and was exalted for us. It concludes with the response of faith both now as children under the cross and then when we come into our inheritance. Recording note: Two items: 1) I think the recording is good, but the line volume was quite low, the raw file had to be amplified which often has the effect of bring forward background noise. I don’t think it is too bad, but if it is worse than I think, please let me know. 2) I left in the recording our final hymn, LSB 573, Lord ‘Tis Not That I Did Choose Thee. I think this hymn captures perfectly the spiritual humility or childlikeness the text call for. Stanza one covers the coarse spiritual pride that I can be righteous in myself, I cannot. Stanza two ponders how that grace works on us while the world yet enthralls, the spiritual pride of claiming the grace, but not for the Kingdom itself but for our own glory – “to thy heavenly glories blind. And stanza three ends as all theology must, in the praise of a doxology, the calling on the name of god in praise and thanks. One of my top 10 hymns. It doesn’t hurt that the tune it is set to is a the slightly melancholy catnip of O DU LIEBE MEINER LIEBE shared with the great Lenten hymn by Savonarola (he of the bonfire of vanities) Jesus, Refuge of the Weary. The life of Savonarola is fitting meditation for the theme of spiritual pride and humility.